It has been requested that this article be rewritten and expanded to reduce the fluffiness in some of the articles (removing exclamation points, removing strategy, etc.) and include a reception section (tagged on 21:55, 26 April 2018 (EDT)). 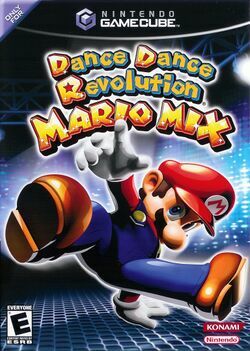 Dance Dance Revolution: Mario Mix (known as Dance Dance Revolution with Mario in Japan and Dancing Stage: Mario Mix in Europe) is a Nintendo GameCube game based on the popular Dance Dance Revolution video game series, but with a Mario theme. Mario Mix utilizes an included Mario-themed dance mat. 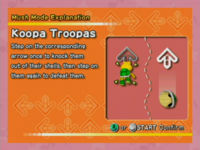 To play the game, players must step on the up, down, left, and right arrows when they line up with a bar on the screen. The player can choose to play with either Mario or Luigi in a number of modes and difficulty levels with nearly thirty songs. Dance Dance Revolution: Mario Mix is the second dancing game to be released on the Nintendo GameCube. Mario Mix is not as intense as standard versions of Dance Dance Revolution; Super Hard difficulty is equivalent to "standard" difficulty in other Dance Dance Revolution games (though some later songs are considered "heavy" in the standard games, especially Bowser's Castle). 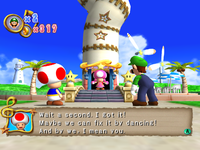 Toadette confronting the two protagonists. The game includes a Story Mode, which the player must clear in order to unlock all of the songs in the game. The playable characters are Mario and Luigi. The opening scene starts out with Waluigi breaking into Truffle Towers. This is trouble as the Music Keys are able to grant any wish. However, when Waluigi opens the door to the room of the four Music Keys, they all scatter across the Mushroom Kingdom except for one that Waluigi gets to keep. Meanwhile, Toad, having seen this, rushes to tell Mario or Luigi, depending on which character the player chose. Toad warns Mario (or Luigi) that someone has stolen the Music Keys and explains the trouble that this causes. Mario decides to go stop Waluigi and Toad decides to come with him to Truffle Towers. On a boat, the two cross a river, and after climbing a vine, reach Truffle Towers. However, once there, the two find the doors to Truffle Tower locked. Waluigi then laughs and tosses a Bob-omb at them, knocking Mario down a nearby Warp Pipe and into a cavern filled with Goombas, though Mario is able to get out by dancing, causing the mushroom he is standing on to grow. After escaping the cavern Mario and Toad enter a shop run by a Lakitu, who has the key to Truffle Towers. He agrees to give it to them only if Mario is able to get rid of the Koopa Troopas playing in his farm. After getting rid of the Koopas, Lakitu gives them the key and they enter Truffle Tower. Inside the tower is Waluigi with one of the Music Keys; he refuses to return it unless he is beaten in a dance off. After beating him Waluigi is gone and the Music Key is recovered. Mario and Toad set off to recover the other keys on a ship, the SS Brass. On their way to investigating a seaside area, a Tweester suddenly appears and causes the SS Brass to spin out, turning a nearby hotel into a corkskrew. Toadette, the owner of the hotel, comes out and scolds Mario for ruining her hotel. Mario, however, decides to dance to fix the hotel, and after the hotel is fixed they set out to sea, only to get caught in a whirlpool. Mario and Toad escape the whirlpool and sail to a nearby island to rest. Here, they find a shop run by a pirate Lakitu who has a device called the "Boogie Booster", which will allow their ship to travel through the whirlpool. Lakitu refuses to give it to them, though afterward decides that they duel to decide who can have the part. After beating Lakitu, he installs the part onto their ship, allowing them to get through the whirlpool Toad notes that the Music Keys have something to do with the storms, and the SS Brass sails into the whirlpool and down to an underwater temple, where a Music Key is being guarded by a Big Blooper. After defeating it in a dance off, Mario and Toad retrieve the second Music Key. Mario and Toad head to their next destination, Wario's Carnival. They arrive at the entrance, which is blocked by two Hammer Bros. who will not let Mario and Toad through unless they are able to beat them in a dance-off. After Mario beats them the Hammer Bros. allow them to enter the park. Inside, they see Wario riding a roller coaster carrying a Music Key. Mario and Toad chase after him on the roller coaster and on foot until finally cornering him in front of a ferris wheel, where he states that he plans to use the Music Key to wish for his own game: DDR: Wario Mix. 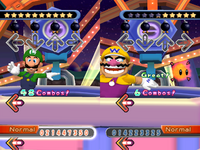 Wario then challenges Mario to a dance off on the ferris wheel, though when he loses he gives Mario the Music Key. Mario and Toad's next destination is a a snow-covered mountain, where they notice the final Music Key inside a Freezie at the top. After failing to climb up the slippery path, they instead enter a nearby Warp Pipe leading to an underground tunnel which ends up taking them higher up on the mountain. After warming up in a nearby log cabin they reach the top of the mountain and try to claim the Music Key, though the Freezie does not give it up. Toad suggests melting it, and after using Fire Flowers on it the Freezie melts and the two claim the key. The two then sled down the mountain, though an avalanche follows them; after avoiding the avalanche the two set off back to Truffle Towers. Mario and Toad return the Music Keys to their original place, though soon after Bowser appears and steals the keys again. Mario and Toad sail to Bowser's Castle in the SS Brass, and after dodging oncoming Bullet Bills arrive at the castle. Bowser is about to use the Music Keys when he finds that they are gone, Mario and Toad having stolen them back. Bowser then challenges Mario to a dance off, and after knocking Bowser away with a rocket he is defeated. Afterwards, Bowser admits that he was going to use the keys to fix his tone deafness. Mario then uses the keys to turn the area surrounding Bowser's castle into a green field, and they suddenly feel strange and start to dance. Waluigi steals the Music Keys from Truffle Towers. Mario agrees to retrieve the Music Keys. Mario and Toad need to defeat Koopa Troopas to go to Truffle Towers. Mario and Toad confront Wario. Mario and Toad in the underground tunnel of the mountain. Bowser appears and steals the keys. Mario and Toad confront Bowser. 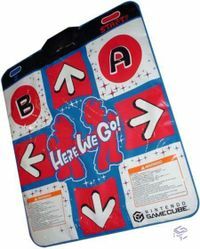 Included with the game is a dance mat (or as Konami calls it, an action pad) which plugs into a controller socket on the GameCube. Then, standing in the center of the mat, the player can simply step on an arrow when it reaches the top of the screen: left, right, up or down. Of course, as the difficulty rises, moves such as jumps to step on two arrows at the same time are required, when they must move around the mat quickly. Incidentally, the game can be sold by itself without a dance mat. The regular controller then uses the or the and the face buttons for directional input, with for up, for down, for left and for right. At the start of each song, a dance meter appears in the upper left corner (and upper right corner for 2 players and Boss Battles/Dance Offs). It consists of ten stars, with each song starting with five (this can be varied with items). As the players get Perfects and Greats, the meter rises. When they miss, it decreases. In the Options menu, the player can set how much a miss decreases their dance meter, and in Story Mode, the higher the difficulty, the more they lose. The meter will flash if the player is under two and a half stars, and when the dance meter runs out of stars, the song will end automatically and they will get an F for the song and a 'Failed' message. In Story Mode, the player will lose a life. A - Can I call you a dancing master? Top grade. A couple, if any missteps. B - You're a fantastic dancer! You should dance one more time! A very good grade with very few missteps. C - Bravo! A fair grade with some missteps. D - Excellent! A significant amount of missteps. F - Wha-wha-wha what?! A ton of missteps leads to this grade, even if the player clears the song. Two major factors decide the grade for a song: number of missteps in relation to the song length and total points. As the difficulty rises, more missteps can still mean a better grade (B), but the A still requires barely any missteps. Perfect: The player hit the step right on the mark. In actuality, there is a margin of error for this step. If they hit the step exactly, the arrow will flash white; if they miss it slightly, it will flash yellow. Either way, max points for step. Great: Also known as Super. The player almost hit the step perfectly. Half the max points for step. Early/Late: The player missed by a bit. No points, dance meter stays the same. Miss: The player didn't step on the arrow at all. No points, dance meter decreases. Getting Perfects and Greats not only increases the players dance meter, it adds a combo on-screen. When the player gets a 100 combo, the announcer comments and arrows flash differently when players step on them. A combo stops if the player does a misstep (Early, Late or Miss). 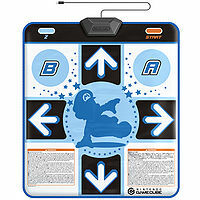 As with all Dance Dance Revolution games, the announcer comments on the player's dancing skill and grade along the way. This can be turned off in the Options menu. If the player's dance meter empties, an option can allow the player to finish the song right away, but the player still gets an F grade. An example of Super Hard difficulty. Easy: only includes left and right arrows. Hard: steps get near 200 at times. Common patterns appear in step sequences. Very Hard: number of steps from 125 to over 200 in some spots. Complicated patterns occur that require shuffling of feet and moving off the center. Super Hard: over 200 steps in each song. Bowser's Castle (song) has 339 steps. Offbeat steps require careful timing. In Story Mode, the player can choose every difficulty except Super Hard at the beginning of the adventure and it stays permanent throughout all the songs. It can only be changed by a Music Wand. 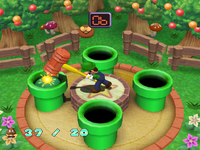 Two players, one as Mario and the other as Luigi, can face off in any song, at any difficulty like Free Mode. However the initial package comes with one dance mat. A second one must be ordered online at Nintendo's official website. * The song only appears in the regular Story Mode. In Story Mode EX, it is replaced by the next song. Story Mode: Waluigi has stolen the Music Keys from Truffle Towers. Toad will accompany the brother of the player's choice in this adventure. Free Mode: All the songs played in Story Mode are unlocked in this mode, where the player can play any desired song at any difficulty, Mush Mode on or off. Minigames: These will unlock themselves while playing Story Mode. A list of these can be found later in the article. Workout: When the players enter their name and weight, the number of calories burned will be kept on record. Before starting Story or Free Mode, Z has to be pressed to set whose record will be updated. Mush Mode is the Mario twist to the standard series genre. Common Mario enemies and items replace steps on the screen and must either be stepped on or avoided. Others cover the screen when missing steps, giving the brothers less time to react. Initially, Mush Mode is enforced in Story Mode, but it can be turned off in options. Mush Mode is optional in Free Mode. On the hardest difficulties, two Mush Mode effects is not uncommon. Help screens come up before the song for each Mush Mode effect. Goombas - Just like regular arrows, squash them. Bob-ombs - Lava Bubbles replace steps and when a brother misses one, it hits a bob-omb, greatly decreasing his dance meter. In dance offs, Lava Bubbles are passed off to the other player and timed back in with the song. Cheep-Cheeps - Cheep Cheeps curve into the screen, giving the player less time to see where to step. They work in the same way as Lava Bubbles in dance offs. Spinies - Step on their spikes and a brother's dance meter will decrease. In the harder levels, they can be timed with real steps. Some move faster than others. Mini-Bloopers and Blooper Tentacle - When a brother misses a mini-Blooper (works as a regular step), ink covers the bottom of the screen, and he cannot see arrows coming up. The Big Blooper will move a tentacle up the screen at a fast rate. In harder difficulties, two tentacles may move up at once. Hammer - Only appears in Hammer Dance. Same as Lava Bubbles in single and dance-off mode. If a brother misses a hammer, it will explode, decreasing his dance meter. Coin Switch - More useful in Story Mode than Free Mode. When a brother steps on a Coin Switch (which moves faster than regular arrows usually) will turn all arrows into coins for a few seconds. Some of them curve in like Cheep Cheeps and move fast. The better the step grade (Perfect to Early/Late), the longer the arrows remain coins. Mario and the Boo gimmick. 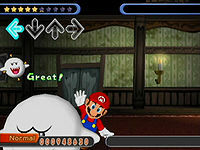 Boos and Giant Boo - A giant Boo sits on the bottom of the screen, and as the player miss steps, it moves up, blocking more of the incoming arrows (creating, in essence, the effect of the "Sudden" modifier on other Dance Dance Revolution games). Stepping on normal Boos push him back down. Arrow Cheeps - They appear only in Frozen Pipes and pop up and change a step's direction halfway up the screen, sometimes even later. In harder difficulties, two may come up at the same time. Freezie and Fire Flowers - Just like the Boos and Giant Boo, except a big Freezie covers the screen and when a brother steps on a Fire Flower, a fireball will move down the screen into the Freezie. Ice Spinies - Just like regular Spinies. Bullet Bill - Found only in Always Smiling. Bill Blasters line up at the bottom of the screen and occasionally shoot Bullet Bills timed as steps. Step on them to redirect the Bullet Bills back to the Bill Blasters. A Bill Blaster has to be hit three times to get destroyed. Rockets - Exclusive to Bowser's Castle (song). Rocket parts replaces some of the steps during the song, they have to be stepped on to build a rocket to the right side. Three consecutive parts fires a rocket at Bowser. Missing a part will decrease a brother's dance meter. Note that if a brother cannot shoot enough rockets at Bowser (and the fireworks sequence does not play), he fails the song. Minigames are unlocked when the players play them in Story Mode. In Story Mode, they provide coins so that the brothers can buy items. The last two games can only be found in Minigame mode. Whack-a-Goomba - The brothers smack Goombas with a hammer as they come out of the pipes. Lakitu returns as the store manager. 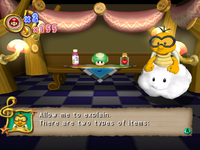 Items can be bought from a store in each world from Lakitu after the player completes Stage 1-3. The classic 1-Up Mushroom can also be won in certain minigames. Sometimes bonus songs are available. All items except the 1-Up mushroom had to be triggered before a stage for the player to feel its effects. The player can only carry three of these items at a time. The player may access the store if they visit it during their progress or before any stage after 1-3, by pressing the Z button. IGN 8/10 DDR Mario Mix is a great Nintendo-ized take on the old dance formula and the first rhythm / music title to hit GameCube that's worth your consideration. The title plays like DDR with Mushroom Kingdom characters and locations. But it does have its share of extras, too, including a unique, (albeit shallow) storyline that reminds us of a Mario Party outing, a variety of logical dance locations and competitions, and some fun mini-games. The biggest disappointment is that there aren't more popular music tracks and Nintendo track remixes to inspire your groove. Eurogamer 7/10 For the poor, deprived Cube owners out there that have been thus far denied the chance to strut their stuff in front of their TV, this is easily the best Dancing Stage title on any platform. That it's exclusive to the little Nintendo boxlet might just help make up for the long wait, and the fact that it comes in a nice big box with a mat included helps sweeten the deal. Sure, Dancing Stage Mario is nothing new, but it's an enduring, bizarre little concept with practically universal appeal, and a great way of wearing out super energetic kids. GameSpot 7/10 DDR: Mario Mix is an introduction to dancing games, and it isn't suitable for fleet-footed veterans. This is too bad, because rhythm action fans would really appreciate the long-overdue gameplay revisions Mario Mix brings to bear. However, with a short story mode that serves as a fun, linear introduction to sequential stomping, Mario Mix is suitable for a child, or for an uncoordinated friend. Many Mario games - Most songs have been based off music from many different Mario games. Mario Party 4, Mario Party 5 and Mario Party 6 - This game uses a modified engine based on these games. Many poses and animations, such as the losing animation, are reused from these games. The song Cabin Fever is an arrangement of Toy Dream theme from Mario Party 5. Super Smash Bros. Brawl - Bowser's artwork from this game reappears as a sticker. Mario Kart Wii - Mario and Luigi's artwork is reused from this game while Baby Mario and Baby Luigi's artwork is based off Mario and Luigi's artwork. Their artwork was also reused in Mario Super Sluggers. Fortune Street - Luigi's artwork from this game is reused. Mario Sports Superstars - Bowser's artwork has been reused for this game. Super Smash Bros. Ultimate - Mario's down smash is now changed to his breakdance kick from this game. The highest score for a song is 100,000,000, achieved by getting Perfect on all 337 steps on Bowser's Castle on Super Hard difficulty. World 1-2 is considered different than the other boards. Its EX song, "Pipe Pop", is the only EX song on the game that is not related to a Nintendo composition whatsoever. World 1-2 is also the only board where both the original starter song and the EX song are remixed from the same artist, who is Wolfgang Amadeus Mozart. This page was last edited on April 3, 2019, at 01:24.